"We're sorry we are having trouble running project cars Please check computer for error messages . You may need to close the game and address the error before turning VR back on. " The game shows up on my monitor but on the Rift, I only get sound. I have tried Eve Valkyrie, Lucky Tales, Albino Lullaby, and Oculus Dreamdeck on my Oculus Rift with no problems whatsoever -- only Pcars. I have been looking for the solution on google to no avail, although I did notice a thread stating both my monitor and Oculus need to be connected to same card. I have my computer hooked up hdmi to a 4K TV. I have tried to get this working for days now and I have no clue what to do. Please help!!!! Yeh I am having the same problem. Oculus support was quick to respond when I mentioned the problem. Had me send in a log 2-3 days ago to see what the problem is. Have not heard back yet and I am still out $50. @gp583 : Did you fix the problem, or does it persist? It's relatively common knowledge that both the Rift HMD and the monitor must be connected to the same video card, and not to the on-board video. The HDMI output must be dedicated to the Rift. If you have more than one HDMI port on your gfx card, connect your monitor to the DVI output (with a passive adapter, if needed). If PCARS still gives an error, I suggest re-installing it after re-arranging the video connections. Correct. 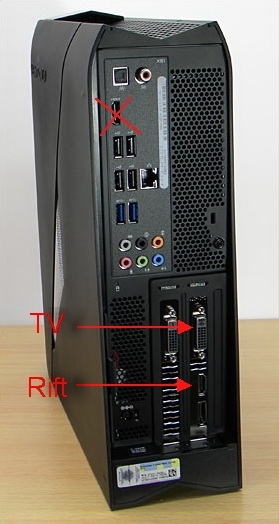 Don't use the HDMI at the top at all, that's on-board video (motherboard, not gfx card), plug the Rift into the bottom HDMI and use an HDMI→DVI adapter to connect the TV. Excellent, glad to have been able to help, mate. Now @gp583 and @marpa84 , are you any wiser? Let's get you sorted. "Due to the extent of the Virtual Reality updates, we strongly recommend that you delete the configuration files that store the various settings. These are found in "\Users\<username>\Documents\Project CARS" and are the files with XML extension." This solved problem in my case.